I’m very grateful to regular visitor Tracy (who blogs wonderfully herself at Biter Tea and Mystery) for recommending this book set in her native Alabama for my virtual tour of the USA via its fiction. Tracy hasn’t actually read her copy yet…maybe I will convince her. BREAKHEART HILL is Ben Wade’s story of love gone awry in small town Alabama. Wade is a middle-aged doctor in the present day looking back on his teenage years. When he was a highschooler aching to escape the town and the life path it represented. Until Kelli Troy moved to town from ‘up north’. First Kelli became his friend then something more. But when she is attacked one summer afternoon on the book’s eponymous Breakheart Hill, a place with a tragic history before the events of 1962, Kelli’s is not the only life destroyed. I loved everything about this book. Absolutely everything. As far as storytelling goes the book is perfect. From the outset we know that Ben is somehow involved in what happened to Kelli. He alludes to the fact himself and his best friend of 30 years keeps niggling away at the subject over the course of their shared lives. But any punishment Ben has incurred, such as returning to Choctaw after finishing medical school and being the best local doctor he could possibly be, is self-imposed. This ‘what really happened’ plot would probably have been enough to maintain my attention but there is more. There’s all the ripples that can be traced to what happened back then. Bad marriages, accidental deaths, missed opportunities. Lives half-lived and some not lived at all. Cook teases all of this out at just the right pace so the book feels like a collection of genuine, interesting surprises but not a jumble of shocks designed for nothing more than their heart-thumping value. It’s a book that prompts lots of “ah, now I see“s rather than “what the heck was that“s. Even the ending is satisfying which is, these days, a rarity. Like the place, the characters here live and breathe. No one is just a trait. A jock or a racist or a nerd or a popular girl. Everyone has multiple facets to their personality which sometimes confirms what we already believe and sometimes surprises. I often fall in love with a single character in a book but here it’s more that I loved the collective that Cook introduced me too. He nails the teenagers who feel everything so intensely and, to their minds, for the first time in human history. Who hasn’t thought they were the first to feel a particular kind of love or anger or sadness? But he nails the adults too. Those who’ve coped with the upheavals of life, those who haven’t. Those who haven’t needed to. All of them are very, very real. Finally the book doesn’t shy away from exploring some difficult themes and ideas. Most of it takes place in the American south in the 60’s and it would be almost absurd if it didn’t in some way look at race. So it does but in a way that manages not to be heavy handed yet remain quite thought provoking. There are other themes too. Friendship. Guilt. Reflection. All deftly handled. Which is all a long-winded way of expanding upon my original point. I loved absolutely everything about this book. This is the 23rd book I’m including in my quest to complete the Reading USA Fiction Challenge in which I’m aiming to read a total of 51 books, one set in each of the USA (and one for the District of Columbia). My personal twist is that all the books are by new (to me) authors. This entry was posted in book review, Thomas H. Cook, USA. Bookmark the permalink. I am very glad you liked this book, Bernadette, and you are right, I will have to read it soon. I did not know it was set in the 60s, which was one of the decades I actually experienced in Alabama. I am looking forward to reading in the next couple of months. I would be curious to see how you respond given your actual experiences of the place. But I’m very glad I read it anyway…will be looking for more by this author. Thanks. OK, another hit says Bernadette. I’m looking for it in my library catalogue right now. You usually steer me to the right books. It’s pretty gentle Kathy…and an older title so hopefully your library has it. Of course, since my library system culled all “older” books, they don’t have this book circulating; only one copy at the main branch. So, I will try to find a used copy. Oh…should have read this comment first. Not sure our library system had any hard copies either but they did have an eBook version for borrowing – about the only time I read eBooks these days. Oh, this does sound good, Bernadette. As I was reading your post, I found myself nodding my head a few times (‘Yup, ticks that box. There’s another box ticked. And another.’). I’m very glad you reminded me that this is out there. I’m so very glad you reviewed this! I had definitely heard of the author. He wrote The Chatham School Affair, which won the Edgar Award in 1997 and he’s been nominated for a number of other awards for his books. I think I read the Chatham book, but I honestly can’t remember right now. However, I’ll be looking for it and also for this one. So great sounding. Thanks to Tracy too for sending you in the right direction. It’s off to Abe Books, which is a used-book seller. They have several copies that are used. It’s a 20-plus year-old book. I’ve had this book on my shelf for years. Good to see you loved it. Now if only I can find it…. 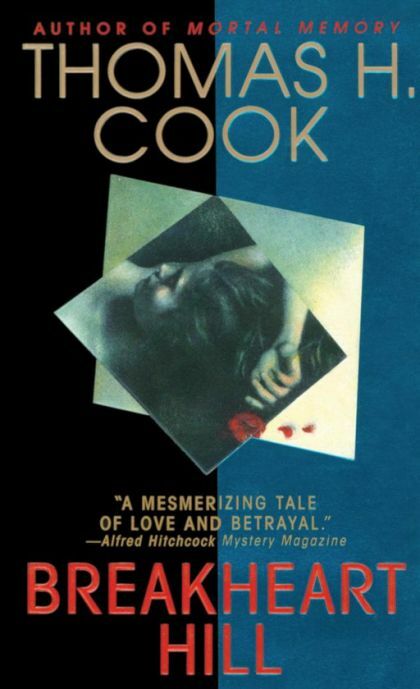 Cook is one of my very favorite crime-fiction writers; I’m surprised he’s not far better known than he is. I haven’t come across this particular novel; clearly I should make the effort.